The outline agreements that a business gets into with its partners is what constitutes Service Contracts. It is these contracts that define the type of services rendered to the party during the agreed period. For often than not, Service Contracts are established for long-term service agreements with business partners that are made against the scope of services and content guaranteed, including the specified tolerance limits that could be set for certain types of parameters, like a predefined timeframe, etc. For example, Service Contracts could include a certain clause that could define the way a company will respond during times when the business with which they entered an agreement with makes a request. If the customer’s machine, for example, runs into a technical glitch, they can be assured of getting the timely help from the company with whom they have an agreement, say like getting the required help or assistance within 24 hours, etc. There are different ways to create a service contract. You either have the option to create it directly or as a transaction follow-up for a service contract template, or a service contract quotation, or a service agreement. Under normal circumstances, a service contract will include an item data and a header data. 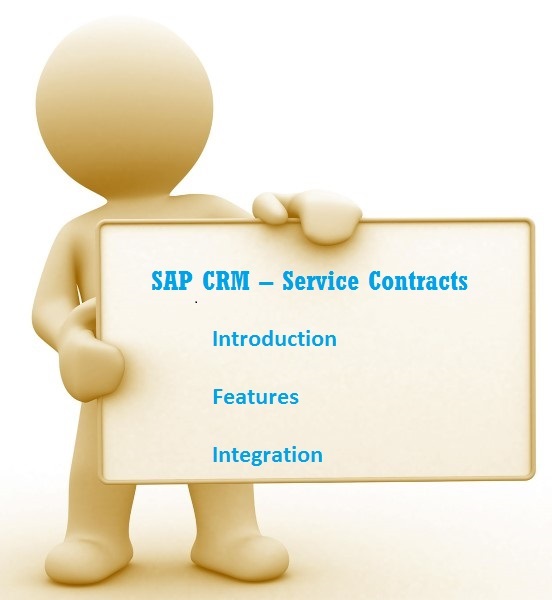 Against each service contract generated, a service product can be defined and this can be claimed at a specified time and over a certain period. A complicated service that could include several materials and services, like the inspection of an automobile. You can have service contacts downloaded onto a laptop and can have them assigned to any document. This way you can track the price changes that take place on the device. Service contracts can also be displayed by internet users. If such a user creates a complaint or a service request, then it can be tagged against a particular service contract and so on.